In this offbeat look at the history and science of different weapons from around the world, Mike explores the cultural context and demonstrates the use of a weapon. He then challenges his co-host, Chad, to improve upon it using modern manufacturing techniques and materials. BLOWPIPE: I flew to Iquitos, Peru in the heart of the Amazon rainforest – it has no access by road – and then took a boat trip up river to meet Yagua Indians. They live an authentic Stone Age existence and are perhaps the most genuinely contented people I have ever met. Their blowpipes are around 8 feet in length and, with a little practice, surprisingly accurate. The blowpipe is primarily a hunting weapon but they told me that within living memory it had been used in war – in tribal raids on villages and they had songs of the ancestors using it in battle. Then it becomes a matter of shooting around the corners of huts, through windows and doorways and from the surrounding undergrowth. It is a form of warfare that resonates with the urban guerrilla tactics of today. The Amazonian blowpipe – pucuna – is made from a hardwood from the pona tree. It is made in two halves with a central channel gouged out. The halves are sealed together with a resin from the briacaspi tree and the bore is then reamed with a hardwood dowel. This was, to me, the most extraordinary part of the process. Obviously the bore of a blowpipe needs to be smooth and have a completely consistent diameter. The reaming rod was itself over eight feet long and was perfectly straight, smooth and of exactly the same diameter for its entire length – quite an engineering achievement. When it came to mixing the curare poison for the darts, it was decided that we wanted to demonstrate this without the essential secretions of the poison tree frog as this is now, sadly, an endangered species. However the concoction of barks, berries and bullet ants was quite a potent mix in its own right. KATANA: The iconic sword of the Samurai. For this episode I went to Japan to see first hand the annual smelting of the special steel – tamahagane – used in the production of traditional Japanese swords. It was a breathtaking experience. The tartara, which is what the smelting furnace is called, was situated in an isolated barn in the snowy mountains of Southern Honshu. I also met with the famous swordsmith Ono Yoshimitsu and with the renowned polisher (togishi) Fujishiro Okisato who were both kind enough to give me some hands on experience as well as being able to witness their astonishing art. At his dojo in Tokyo, Sensei Hyashi Kunishiro taught me the art of tameshigiri – mat cutting – and I had quite a work out learning some iai battojutsu moves. I also got to do some Yabusame – Japanese horse archery – for which I was obliged to wear traditional dress! CHAKRAM: In India I met the Akali Nihangs, a nomadic sect of Sikh warriors, from whom I learned various techniques for throwing the chakram – a razor edged steel battle quoit – both on foot and from horses and elephants! Although it was my first experience with the chakram I managed to throw one 40 yards with no trouble at all. The chakram has an airfoil cross section and you can see it working – it really does fly. And it is surprising how quickly one can become accurate with it at shorter ranges. 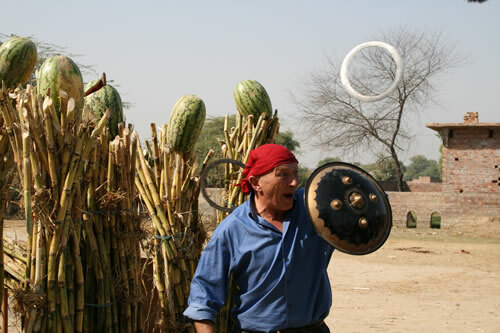 Nidar Singh, an expert in Indian martial arts, showed me many different techniques for chucking the ‘chakkar’, as the chakram is more commonly known in the Punjab. The tajini method of spinning it on your index finger is the most well known but there are other methods, such as bowling it underarm as you approach an enemy, throwing it on the move or the more powerful diagonal throws from left to right and right to left. As well as the different types of throw, there are many different types of chakram – from the standard ones around 9 -10 inches in diameter to small bracelet sized ones worn on the forearm and flicked at an enemy’s face at close quarters with an action similar to flicking a deck of cards. At the other end of the scale are the large chakrams of two feet diameter, which are worn around the neck. Nidar showed me a technique for dploying these from the second or third ranks behind the front line when engaged in hand to hand fighting – they are thrown almost vertically to descend on the heads of the enemy’s front line. I also travelled to Patiala where I met the brothers Harinder and Mobinder Singh who showed me how to make a chakram in a traditional forge. CHU KO NU: I travelled to China for this episode about the Chinese Repeating Crossbow (chu ko nu), where I met Yang Fuxi, an eighth generation Beijing bowyer. Not only did I acquire a repeating crossbow from him but also a replica of a Han dynasty crossbow and a beautiful recurve bow. It was a great privilege to meet Yang Fuxi. During the cultural revolution traditional crafts such as bowmaking were made illegal. His family had to destroy everything todo with bowmaking. However they kept one bow. It was cut in half and hidden in two separate places. When the cultural revolution came to an end, the bow was retrieved and Yang persuaded his father to teach him everything about the family craft. DUELLING PISTOLS: I’m spelling it with two Ls here because that is the correct English spelling. The show will be titled Dueling Pistols with one L, which is fine, because that is the correct American English spelling. It was difficult to find a firearm for the series because, obviously, Chad could just go to the store and buy the latest improvement. How do you improve on a Brown Bess musket? – buy a Kalashnikov. The answer lay in the duelling pistol because this was a weapon that could only be used under strict rules. We could therefore give Chad rules. Duelling pistols were quite distinct from the ordinary flintlock, and later percussion, pistols of the day. The most significant difference was the hair trigger. In a duel you wanted the least possible muscle movement in you shooting hand so as not to affect your aim. However a hair trigger in the hurly burly of the battlefield would be a liability. The barrels of duelling pistols were longer for greater accuracy and they had other refinements to ensure faster ignition such as roller bearings on the pan cover and gold plating round the touch-hole to prevent fouling. They were usually fitted with sights and the barrel and gun furniture were browned so there would be no glint to distract the shooter’s aim. Barrels were made thicker than they needed to be to counteract muzzle flip. Duelling Pistols were created for a specific purpose – a single aimed shot in controlled conditions and were quite different to the run of the mill flintlocks that were used in all manner of circumstances. Flintlocks had been around for over a hundred years before the dedicated Duelling Pistol was born. Most importantly Duelling Pistols were balanced to bring the dueller’s arm quickly and naturally into the aiming position and, above all, they were elegant and beautifully made. I was quite jealous that the producers sent my co-host Chad to meet Greg Murray in Tennessee for this one. He is a very fine gunsmith and a craftsman of the old school who produces exquisite work. This episode was filmed in the USA, well apart from a short sequence on the history of the duel, done in the UK with my regular sparring partners, and part of the history of the gun sequence, which was filmed in Denmark, where they have a wonderful replica of the Loshult gun at the Middelaldercentret at Nykobing. FLAMETHROWER: We travelled to Devon, UK to see a working replica of a 7th century Byzantine Fire Siphon and I then went to Germany where I got to row on a replica of a Roman Galley. The idea had been to test how quickly an oar-powered vessel could stop and otherwise manoeuvre in the water. I also made and tried out my first fustibal for this show. A fustibal is a staff sling – like a regular sling only mounted on a 3ft stick. It was used to hurl crockery pots of Greek fire. It worked extremely well and was tremendous fun to use. It linked, of course, to the idea of there being more than one way to throw flames and led to us visiting the magnificent full size Trebuchet at the Middelaldercentret in Denmark, which hurled 2ft diameter fireballs for hundreds of yards. Spectacular! 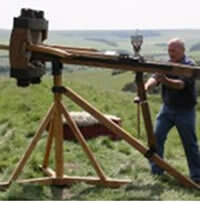 SCORPION: I operated a working replica of a Roman Catapulta, which we had set up at Maiden Castle – an Iron Age hill fort in Dorset. It shot staggering distances. The first shot from the outer perimeter cleared the top of the central mound. Unfortunately we didn’t have the time to pace it but I would estimate that it was in excess of 400 yards. The Romans had two words for their artillery engines – Catapulta and Ballista. It is generally accepted today that a Catapulta shoots darts or javelins and a Ballista shoots stones. However the Romans tended to mix the two words up and there really is no consistency in which word applies to which machine. The Scorpion is a medium sized battlefield catapulta, so called because, in profile, its shape is reminiscent of a Scorpion – it has a wide thorax and a tapering tail. At the end of the tail is a sting. On the Scorpion this is represented by the small upright lever of the winding mechanism. CHARIOT BOW: For this show I visited the Equine Extremist Tommy Turvey in Illinois to try out his chariots. The chariots were modern stunt versions, heavily built in steel but Tommy’s horses were very fast and fabulously well trained. 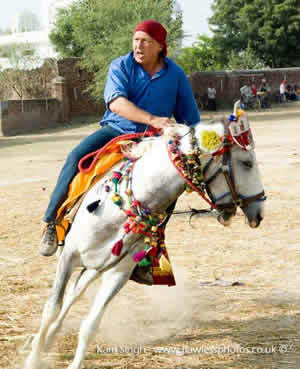 He is a genius with horses and I learned a lot from him. It was January in Illinois so we worked in the indoor arena, which was about 60 yrads from end to end. Once we’d set up the targets and you allow room to turn and wheel in front of them, it gave an oval of around 40yards end to end for me to see how many arrows I could get into the target zone in a wheeling charge. I had previously managed 10 – out in the open in the desert with an end to end oval of around 200yards. Here I managed 4 in the 40 yard oval – shooting both as we drove towards and away from the targets. I also visited Lukas Novotny in North Carolina who makes exquisite composite bows in the traditional way with horn and sinew. He has made perfect replicas of the Egyptian angular bow, as well as all styles of composite recurve bow. As well as marvelling at Lucas’s craftsmanship, I had a good time practicing my horse archery on his well laid out course. HALE ROCKET: This show was filmed entirely in the USA and included a trip to Fort McHenry, site of a naval bombardment during the War of 1812. Congreve rockets from the British ships lit up the night sky inspiring Francis Scott Key to write the Star Spangled Banner. The history of rockets sequence was fun to do and I was especially pleased to shoot a Chinese rocket arrow with the fabulous bow I had brought back from China. In spite of the snow storm that swept in on our final testing day, we had a tremendous time launching the rockets and our full weight replicas of the Hale performed surprisingly well. ATL ATL: I went to Nevada’s Valley of Fire to see the millennia old petroglyphs depicting this most ancient of weapons. I hadn’t used an atl atl before and completely fell in love with it. Its a really fun weapon to use and surprisingly accurate. According to Bernal Diaz, a 16th century Spanish chronicler, the atl atl of the Aztecs was capable of penetrating any Spanish armour. Now of course the Conquistadors had all manner of armours. They had mail shirts worn over thick arming doublets, they had brigandines and, to a more limited extent, they had plate back and breasts. We tested the atl atl against a munition quality plate breastplate as that could be considered the top of their range. Unsurprisingly, the flint tipped darts failed to penetrate, though they did bite into the metal and cause significantly more indentation damage than anticipated, indicating they were were striking with considerable force and transmitting a great deal of shock.